Nick and Sheila Nicholas established this small family winery in 2001 devoted primarily to Pinot Noir from estate grapes. 33 acres are owned and farmed in the Chehalem Mountains. The property was originally an overgrown walnut, hazelnut and plum orchard with a neglected Christmas tree forest and included a quaint farmhouse dating to 1902 and several wooden outhouses. The vineyard is planted in primarily Jory series soils at 450 to 650 foot elevation. Clones are Wädenswil, Pommard and Dijon 114, 115, 667 and 777. Plantings began in 2001 with additions in 2008. The L.I.V.E certified vineyard is farmed sustainably with both organic and biodynamic practices. Vineyard managers are Evan Bellinger and Buddy Beck. The winemaker is noted Oregon veteran Aron Hess (Daedalus and others). 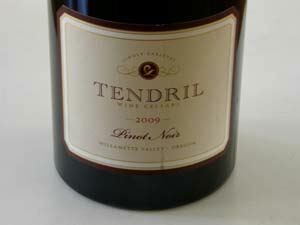 Production is about 1,000 cases annually of primarily Pinot Noir. Chardonnay will be added in near future. A tasting room is open daily at the junction of 99W and Highway 240 in Newberg. The wines are sold to a mailing list and through the winery’s online store at www.anamcaracellars.com. 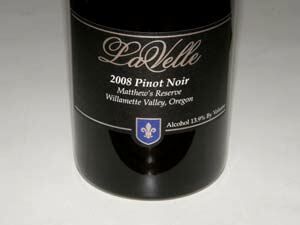 One of the appealing features of Willamette Valley Pinot Noir is that it shows considerable vintage variation. 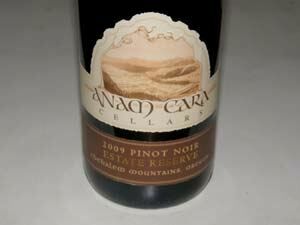 The Anam Cara Pinot Noirs in 2009 are more classic and forward in style in comparison with the 2008 vintage wines that were reviewed previously. The wines are lighter, elegant and very charming, yet have the balance for medium term aging. Because of the growing conditions in the 2009 vintage, less new oak was used than in 2008. I would drink these while you wait for the 2008 Pinot Noirs to come around. 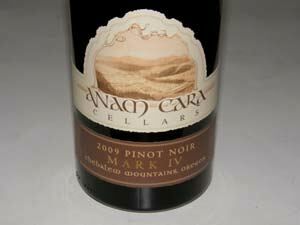 All wines are bottled in recycled US-made Ecoglass which has 25% less weight than Anam Cara’s previous glass bottles. 13.6% alc., 627 cases, $32. A mix of all clones (except 2A) in the estate vineyard with predominantly 667. Aged in 16% new French oak barrels. · Light reddish-purple color in the glass. The nose has mostly oak-driven aromas initially, but becomes more fruity over time in the glass offering scents of red raspberries and red cherries. The wine has a light weight core of juicy cherry and blueberry fruit with an underpinning of oak. A little more body than the Heather’s bottling. Silky in the mouth with very soft tannins. An easy drinker whose delicate fruit is outflanked by oak currently but the balance should improve over the next year in bottle. Good. 14.0% alc., 55 cases, $65. 100% Dijon 114. Aged in 22% 1-year-old and 78% 2-year-old French oak barrels. Intended to be the most elegant expression of the vineyard and thereby the lightest touch of French oak. From 10 rows of what are considered reserve quality vines, cropped to 1.5 tons per acre. This wine is named after the owners’ daughter. · Very light reddish-purple color in the glass. Terrific aromatics featuring an enticing perfume of red cherries, red raspberries, Christmas spice, herbs and crusty bread. Light in weight but flavorful, picking up intensity over time in the glass. Cherries are the theme with hints of savory herbs and oak. Silky and feminine in style like fine red lingerie. Very good. 14.0% alc., 240 cases, $42. From special sections and rows of the vineyard with Reserve potential and a best barrel selection. Yields 1.5 tons per acre. Clones are Pommard, 114, 115 and 777. Aged in 24% new French oak barrels. · Light reddish-purple color in the glass. Reserved but welcoming aromas of black cherries and darker red berries. Striking medium-bodied black cherry core which impresses the mid palate and lingers for half a minute on the finish. Smooth as a baby’s bottom with reserved tannins. Very classy and always the best wine in the Anam Cara stable. 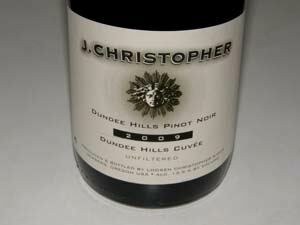 More reserved and elegant than the 2008 version of this wine, but more Pinot character. 14.0% alc., pH 3.50, TA 0.53, 55 cases, $65. A blend from the most intense barrels which can handle more new oak. 75% Dijon 777 with lesser amounts of 114, Pommard and 115. Aged 11 months in 22% new French oak barrels. Will not be released until the spring of 2012. · Light reddish-purple hue in the glass. The nose develops very slowly in the glass, reluctantly revealing aromas of dark red fruits and dark red rose petals. Similar to the Reserve in flavor profile but possessing a bigger tannic backbone. Seductive flavors of crushed black cherries, red raspberries and red currants with subtle complimentary oak and reigned in sinew. Smoothly fashioned with a long, scented finish. Not as expressive as it will be in a few years and may supersede the Reserve with a few years in the cellar. Very good (+). Camp, the former president of Annie Amie Winery, developed a passion for Pinot Noir more than 30 years ago and began importing the Burgundy selections of Becky Wasserman, making frequent trips to the Burgundy estates she was representing. Camp is also the mind behind the Stepping Stone by Cornerstone label that offers a number of varietals from the Napa Valley. 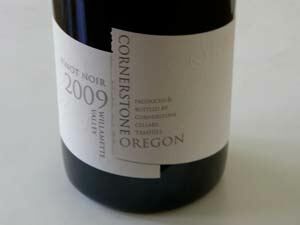 The 2009 Cornerstone Pinot Noir is composed of multiple clones from the Eola-Amity Hills (37%), Yamhill- Carlton District(21%), Chehalem Mountains (21%), Ribbon Ridge (13%), and Dundee Hills (8%) sub-appellations of the Willamette Valley. The wine was aged 14 months in 60% new French oak barrels. Tasting is offered at the Yountville Tasting Center in the Napa Valley at 6505 Washington Street. The wine is sold through a mailing list and offered online at www.cornerstonecellars.com. There is limited retail and restaurant distribution. 13.9% alc., 400 cases, $50. · Moderately light reddish-purple color in the glass. Nicely perfumed with aromas of black cherries and spice. 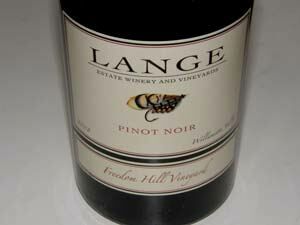 Delicious medium weighted flavors of blueberries, black cherries and black raspberries with an emphasis on cherry. Riffs of cola and spice add interest. Juicy with restrained, dusty tannins, well-honed acidity and the slightest complimentary oak in the background. The flavors are ahead of the aromas at this stage. A beautiful wine that shows impeccable balance for the cellar but can be thoroughly enjoyed now. An All-American for 2012. 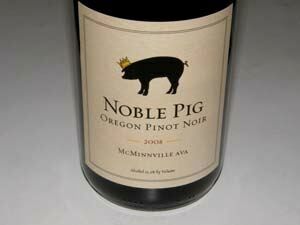 Noble Pig Winery was established in 2008 by winemaker Cathy Pollack and her physician spouse Henry. The couple spent most of their life in Southern California where Henry had a successful practice, but health problems cut his career short and they change direction. The family moved to Davis, California where Cathy enrolled in the school’s enology and viticulture program. For her thesis, Cathy formulated a plan for a marketing and promotional program for a hypothetical winery she dubbed Noble Pig. She was inspired by a story from the 19th century of an English King who presented the Japanese emperor a prized Berkshire pig to strengthen their relations. The Pollacks found a home in the McMinnville AVA where they bought 88 acres and planted the first 4 acres of Pinot Noir in 2010. The initial releases are from purchased fruit while the estate vineyard matures. Eventually, they plan to produce about 5,000 cases annually. Pinot Noir, Pinot Gris and Pinot Blanc are offered. The wines are sold through the website at www.noblepigwine.com. A tasting room is shared with J. Wrigley Vineyards in a small cottage in Carlton. The Pollacks also have a terrific food blog with mouth watering recipes and photography at www.noblepig.com. 13.7% alc., 278 cases, $18, screw cap. Sourced from a very old vineyard in Yamhill County. · Pale yellow color in the glass. Fresh aromas of apple, poached pear, baking spice and warm honey. The flavors echo the aromas with an added note of grassy herbs and petrol. The fruit is crisped by the bright acidity and the mouth feel is slightly creamy. Pinot Blanc is my favorite casual and comfortable Oregon white wine. Very good. 13.2% alc., 100 cases, $34. Clones are Pommard and Dijon 114 and 115. Aged 12 months in French oak barrels. · Moderately light reddish-purple color in the glass. Aromas of fresh cherries, leaf, stem, cut flowers and apple core. Essence of black cherries and dried cranberries with subtle herbs and oak in the background. Aims to please with moderate silky tannins and a welcoming elegance. The wine acquires more body and interest over time in the glass, but is a bit austere and reserved lacking some mid palate verve and finishing strength. A little better the following day from a previously opened and re-corked bottle. Tasted twice. Good. 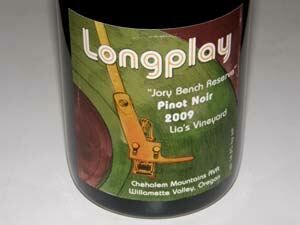 For 2009, there are seven Pinot Noirs offered, both appellation blends and vineyard-designates. The wines are sold on the winery’s website at www.jchristopherwines.com and through fine wine retail channels. The J. Cru Club offers members first crack at newly released wines, notice about events at the winery and other news about J. Christopher wines and gigs. 13.5% alc., 1,500 cases, $28. The flagship wine. 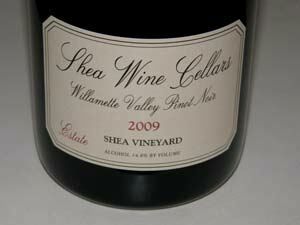 A blend from vineyards in the Dundee Hills, Chehalem Mountains and Eola Hills. Made with native fermentations and up to 18 months of French oak aging. Unfiltered. · Moderate reddish-purple color in the glass. Aromas of black cherry mash, mushrooms, brier patch and grassy field. 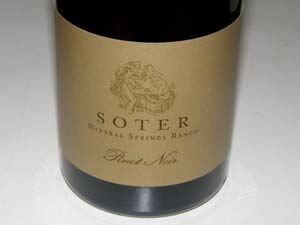 A savory wine of interest with earthbound flavors of darker red stone and berry fruits with a hint of herbs and grass. Nicely composed with silky tannins and some persistence on the aromatic finish. Even better two days later from a previously opened and re-corked bottle. Very good. 13.5% alc., 450 cases, $35. A barrel selection from several vineyards including Bella Vida, Baptista, Maresh, Charlie’s, Abbey Ridge and Le Pavillon. Unfiltered. · Moderate reddish-purple color in the glass. Very shy initially, but opens beautifully over time in the glass revealing aromas of dark red and purple fruits with wood spice and subtle oak vanillin. Earthy and charming, with a medium weight core of darker Bing cherry and raspberry flavors perfectly accented by oak notes of spice and anise, and displaying a fancy thrust of pure fruit on the finish. Light on its feet and very accommodating. A step up over the Willamette Valley bottling. 14.1% alc., $38. Sustainably farmed vineyard planted in Nekia soils. Winemaker is Patrick Mahaney. · Moderate reddish-purple color in the glass. Very earthy nose replete with aromas of mushrooms, forest floor and oak. Ripe cherry and berry fruit veering to the red side with a hint of anise and oak. Well-behaved tannins with some persistence on the bright finish which shows a good cut of acidity. Pushes the ripeness envelope. The flavors trump the aromas at this stage. Good. 14.8% alc., 3,555 cases, $40. An expression of the entire Shea Vineyard including Pommard, Wädenswil and four Dijon clones: 777, 114, 115 and 828. Aged in 47% new French oak barrels. 10% wood tank fermented. · Medium reddish-purple color in the glass. Very lovely nose offering vibrant aromas of dark cherry coulis, spice, rose petal, violets, sassafras and malt. Very tasty essence of black cherries and black raspberries with a complimentary touch of spice and anise. Charming with moderate fine-grain tannins and a fruit-laden finish. Can be enjoyed now. Very good. 13.0% alc., $48. 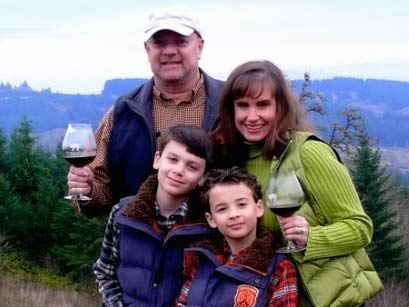 This vineyard is owned by Ken and Karen Wright and is located in the Yamhill-Carlton District AVA. Label artwork by David Berkuam is a homage to field workers depicting harvest. · Moderately light reddish-purple color in the glass. The aromatics are a bit unusual opening with a little reduction funk which resolves revealing scents of spiced red berries, rose petals, cotton candy, sweet oak and other unidentifiable aromas. Sweet blue and black fruit on entry, austere and unripe in the middle, finishing with a kick of citrus peel acidity and tartness. Minimalistic and acidic. Could be an off bottle. Decent. 14.0% alc., $60 (sold out at the winery). A blend of several old vineyards primarily grown on Laurelwood soils in the Chehalem Mountains AVA. · Moderately dark reddish-purple color in the glass. Aromas of dark berry jam and plum pudding with a hint of stem and underbrush. Spicy and sweet array of red and black berry flavors robed in firm, muscular tannins, finishing with lively acidity and a floral note. Solid but not exceptional now. Good. 13.9% alc., 430 cases, $35.99. The first reserve from this winery since 1998. Very impressive when tasted in September 2010. · Moderate reddish-purple color in the glass. Slowly evolves in the glass eventually offering intense aromatic charm with scents of black raspberries and dark stone fruits. Moderately intense core of black cherry and black raspberry flavors with accents of tea, cola and anise. The fruit really sings a high note from the eye-popping entry to a finish that seems to last an eternity. The tannins have melded and the texture is all silk and satin. Divine. 14.3% alc., $25. Todd Hanson grower and Aron Hess winemaker. · Light reddish-purple color and slightly cloudy in the glass. Faint aromas of red fruits with noticeable oak toast. Fruity, smoky and savory in a lighter style featuring flavors of earth-kissed red cherries and berries. A very gentle wine that is of interest for its pinotosity and drink ability but doesn’t deliver enough flavor. Good (+). 14.1% alc., $46. · Moderately intense reddish-purple color in the glass. Complex perfume exhibiting scents of purple fruits, spice, cigar box and toast. A medium weighted, tasty wine that offers layers of flavors including fresh plums, blackberries and Hoison sauce. The wine flows smoothly over the palate and lingers on the finish for what seems like 60 seconds. Hearty tannins are now evident, but they are well balanced by the fruit and acidity. 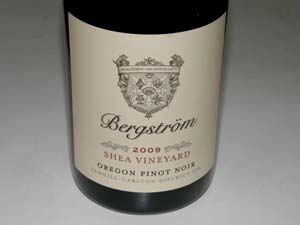 Shea Vineyard performed beautifully in this vintage and Bergström has spotlighted this iconic fruit source beautifully. This wine will have many fans. 13.4% alc., $30. · Moderately light reddish-purple color in the glass. Lacking fruit-driven aromas, the nose offers scents of brier, leaf, mushroom and toasted oak. Medium-weighted earthbound flavors of black cherries and raspberries with a significant wood smoke component. Silky soft on the palate but somewhat bland in the middle and shallow on the citrus-driven finish. Decent. 14.6% alc., $40. · Darkly colored in the glass. Aromas of black raspberries, cassis, spice and oak. The flavors echo the aromas in a richly endowed fruit-driven wine with a mild oak presence in the background. Big and darkly fruited and a touch on the ripe side with a hint of raisin. Lacks the Dundee Hills signature. Good. 14.1% alc., $45. · Moderately light reddish-purple color in the glass. A chameleon in the glass, constantly changing. Various aromas are evident, including ripe plum, blackberry jam, spice, rose petals, and kid glove. Discreetly extracted flavors of black raspberries, black cherries and a hint of strawberries all wrapped in firm, ripe tannins. Silky with pleasing finesse, offering a big lip-smacking finish. Still great two days later from a previously opened and re-corked bottle. 13.4% alc., $30. Robin and Mike Murto’s vineyard was established in 1978. Indigenous yeast fermentations, aged 18 months in French oak barrels. No fining or filtration. · Moderately deep garnet color in the glass. Aromas of fresh picked red berries with a subtle green stem note. Slightly sweet dark red fruits are lighter weighted and somewhat buried in muscular tannins. Much better two days later from a previously opened and re-corked bottle displaying more vivid fruit and much less aggressive tannin. A good cellar candidate. Very good. 14.5% alc., 90 cases, $55. Pommard clone. · Moderate reddish-purple robe in the glass. Aromas of crushed strawberries, raspberries, sandalwood and vanilla pastry. The slightly confected flavors echo the nose with added notes of black cherries, cranberries and the faintest oak graham. Very soft in the mouth with pillowy tannins. Very good. 13.5% alc., 250 cases, $60. · Moderately dark reddish-purple color in the glass. Welcoming aromas of black plums, dark cherries, cassis, forest floor and damp earth. Soil-inflected core of intensely flavored black plum fruit that is beginning to shed its baby fat. Since last tasted in 2010, the tannins have become softer, the oak has faded into the background, and the wine is exhibiting an amazingly long finish with a pleasingly bright cut of acidity. The wine has the balance for long-term aging. Put on your big boy pants when you open this one. 14.3% alc., $45. Winemaker Tony Rynder’s first label after making wine for others for 20 years. · Moderate reddish-purple color in the glass. Very shy aromatics with demure aromas of berries, fennel, cut flowers and roasted nuts. Medium weight tasty core of black cherries and black raspberries with a complimentary spice and vanilla accent. Very charming in the mouth, striking an impression on the mid palate and sporting a pleasing velvety texture. The flavors trump the nose at this stage. Very good. 13.5% alc., $45. A tall, very heavy bottle. Clones 777, Wädenswil and 115. The winemaker is Ken Wright. · Moderate reddish-purple color in the glass. Savory nose offering aromas of mushrooms, wet leaf, oak and pharmaceutical notes with dark red cherries and berries in the background. Redder fruits are featured with a touch of blueberries, pomegranate and spice. Fairly silky on the palate, but exhibiting firm prodigious tannins, finishing juicy with a bright nerve of acidity. The fruit is buried in the tannins at present. Good.